Well... Tonight was one of those very rare steady nights for me. It was slightly misty so no good for Deep Sky, hence I thought I would turn my attention to another attempt at Sirius and the Pup. I Started out with the C5 using an 18mm homebrew crosshair eyepiece. The plan being to hide Sirius behind a cross hair to reduce glare and improve my chances. A quick look at Mars told me the crosshairs were about 10 arc seconds thick, so I had a good sense of scale. At around 20:15 (UT) Sirius was low and had its usual 'flaming appearance', but I was getting occasional glimpses of the first ring so things were looking good. However despite half an hour of just hiding Sirius behind the cross hair I could not spot the pup. I was about to give up, but a movement slightly jogged the scope and Sirius was now blazing in full view... and I could not believe my eyes. For about 1 second I noticed a little point of light just trailing behind Sirius and then the 'flames' washed out the view. The little point of light would briefly re-appear every few minutes or so confirming the sighting. As Sirius got higher (about another half an hour later) the seeing became very steady and I could hold the Pup in view for 4 or 5 seconds at a time. I thought I wonder if the little C90 will see this... Sure enough it can! - Nothing like as easy as it was in the C5 and it required very careful adverted vision, but over about 15 mins I got 5 glimpses of the Pup for about a second or so. I'm not sure if I would have seen it first in the C90, as knowing exactly where and what to look for, plus both scopes having the same focal length and eyepiece really helped (It's so much easier to see again once you have first spotted it). 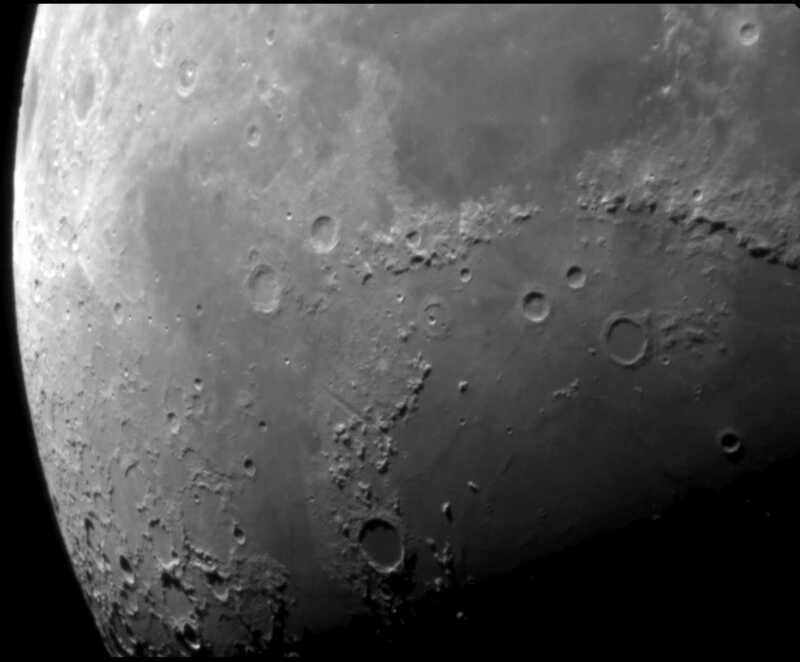 I also tried a 10mm Plossl (and I really wanted this eyepiece to work, since it only cost £3 new!!! ), but no - Just one possible brief glimpse in the C5... 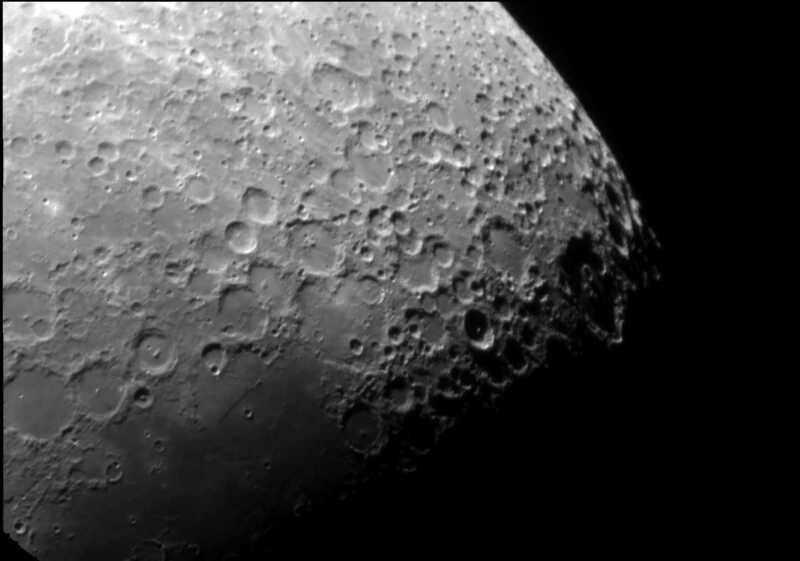 The 18mm (only 70x) seemed to be the correct eyepiece tonight. But hey, in what must be ~30 years I've never seen the Pup before... and to be able to glimpse it in the little C90 really surprised me. I won't forget tonight. I recently received a new C90 as my first scope in years from a large online vendor and I've been pretty happy with it so far. Today, sadly, I noticed that a tiny metal fragment or speck about 1/2 the size of a grain of rice is sitting loose inside the tube. Since I've handled the scope quite carefully I'm thinking it might have left the factory that way (a deburring leftover?) and only became visible now. I'm concerned it might scratch the mirror as I transport the scope around. I'm not sure whether to exchange it or try and remove the fragment myself by opening up the front corrector cell. 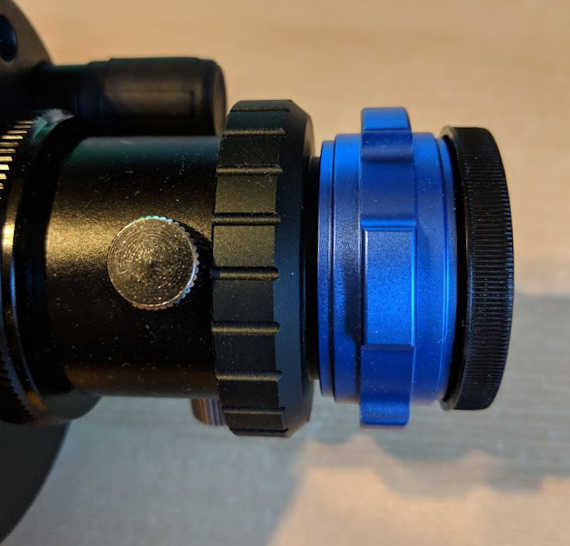 I searched the forum and someone said they used a strap wrench to unscrew it, but it looks like it's pretty tight on there and I worry I could mess up the collimation. Any advice, thoughts, or ideas? Ps. I took a picture, but I'm not sure how to upload it to this post. Edited by chirality, 12 January 2019 - 03:53 PM. 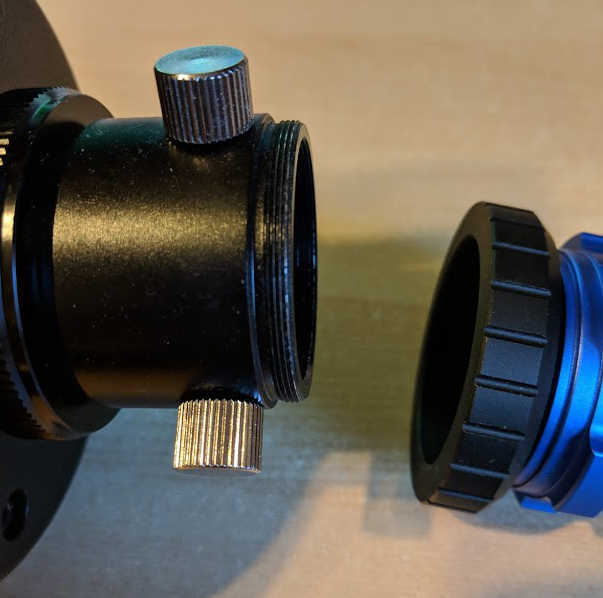 If you do unscrew the front corrector there is a chance that you will need to re-collimate afterwards, which will be moderately difficult the first time you attempt it. However this is a skill you should probably learn anyway (as a sharp knock to the tube or bumpy car trip can also cause misalignment) and its not really that difficult to master anyway. However, the foreign object is so small, that it will have no measurable effect on the images the scope produces. Personally I would leave it alone and enjoy using the scope. Are you sure it's even metal? Even if so... the tiny size means it's mass will be so small, I can not see it harming the optics (and that is only if it can be made to move relatively quickly against an optical surface in the first place). 1. Unscrew the corrector cell and remove with a puff of air (preferred method), or maybe with the corner of a clean paper towel very gently touch it so it falls off the surface. DO NOT rub or push it across the glass surface! Then it might need re-collimation after reassembly. Note my old ETX 90 did not need re-collimation when I removed the cell for cleaning (it was brought 2nd hand). Nor did my C90 when I removed a free O-ring Celestron (or Synta) left in there during assembly! The trouble is (as you are aware) the front cell can be rather tight to unscrew. So only apply rotational pressure between the tube and the front cell. Perhaps two people, one grasping the tube and the other rotating the front cell. 2. Return for a replacement, but that depends where you brought it from. It's possible some retailers might insist nothing is wrong and charge a restocking fee. Got out this evening and imaged the moon, until I froze... Here's a quick processing of some images with the C90. 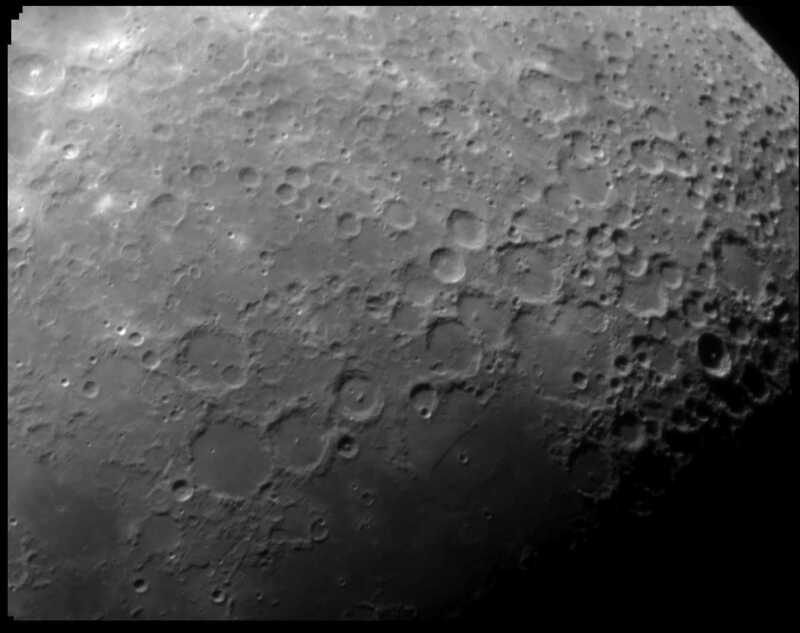 Edit: Used a ZWO ASI120 camera collected approximately 1500 images, aligned and stacked the best 20% in Autostakkert2. I need to work on my dynamic range and get the images a little lighter. Awesome, Jaimo - looks great! I’m hoping our skies stay clear for the lunar eclipse this Sunday - hoping for some quality time with the C90! Well my C90 has been shelved for awhile on account of lack of time and bad weather. But I have a mounted binocular comparo lined up as soon as I get some clear low or no moon skies - 12x50 Celestron Granite EDs vs. 12x50s Nikon Action EXs. The C90 will ride on a Nextsar SE mount and be equipped with a GLP finder to direct the binoculars through a series of suburban DSO targets. Alexa, find the Orion Nebula. Jaimo - great hack! Does it change the focal length at all? From the pics, it looks like it might make it longer. Maybe a little... I really do not know. I use this scope almost exclusively for planetary and lunar observing/imaging, where a little more focal length is usually welcome. Good point! That’s what I use mine for too. could you eliminate the stock adapter completely and thread the twist lock directly onto the rear of the scope ? if yes, that would shorten the focal length a good bit. Any idea if that would have an adverse effect ? I'm sure that somewhere back in this thread I or someone else have described how to attach a diagonal directly to the rear of the C90 without the supplied visual back. I believe there is an adapter ring that allows you to do this. In fact, this is what I do. Actually, that post tells how to directly connect a diagonal with a reducer/corrector, but you get the idea. Edited by Sarkikos, 27 January 2019 - 04:52 PM. That's pretty slick Mike, are you able to rotate the diagonal once it is affixed? I often use a GEM. First thing I did after ordering the C90 was order this thing and happy with it. thank you mike and Jeremiah. Never ceases to amaze me how many mods people have discovered for this little scope ! Does that take the place of the VB? I offered $15 earlier this evening for my son's 127mm Mak... Great minds think alike. It goes very well with the "something for nothing" theme. This requires a T2 diagonal. Edited by Sarkikos, 01 February 2019 - 09:48 AM. 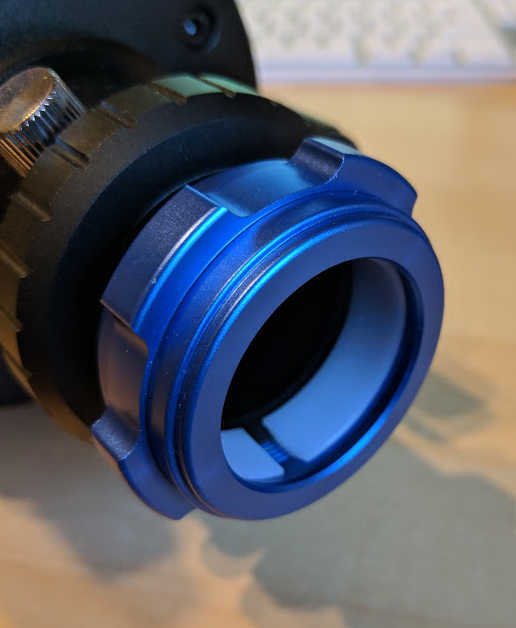 I bought the adapter ring from Agena AstroProducts: Blue Fireball SCT Thread Adapter for Maksutov-Cassegrain Telescopes. https://agenaastro.c...-telescope.html They are out of stock now. I don't know where else they are available. Actually, although I was calling this adapter a "T2-SCT adapter," the threading is not T2. It is "Maksutov thread," M44.5 x 1.0. This is the threading at the rear port of the C90 - or at least the newer C90's. T2 is M42 x 0.75. Somebody correct me on this if I'm wrong. Confusing, isn't it? Yeah, I think so. Where does the OAG go? 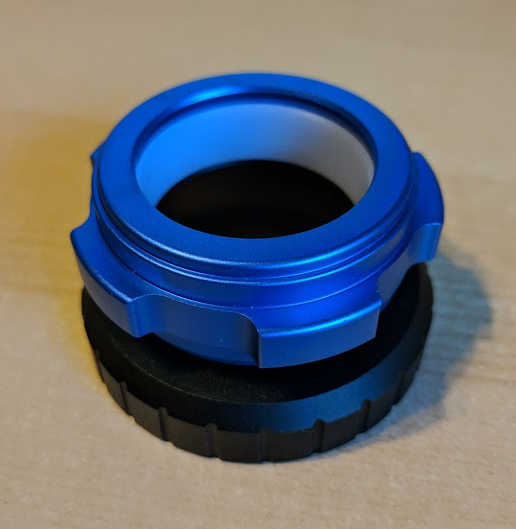 NV Binos with high magnification..? Guiding with a Bahtinov Mask?